Your tax dollars at work: Our U.S. government has no problem spending a trillion dollars on an optional war in Iraq. Or spending many trillions bailing out rich Wall Street bankers to reward their greed and avarice. But when it comes to deploying a FREE, open-source Web browser on government computers? Now you’ve really gone too far, man! The U.S. State Department currently uses Microsoft Internet Explorer as its one and only Web browser. At a town hall meeting led by Secretary of State, Hillary Clinton, a new State Department employee asked Clinton to “please let the staff use” the Mozilla Firefox browser. The employee pointed out that Firefox had been “approved for the entire intelligence community,” and that it’s a “much safer program.” The rookie’s question was met with a chorus of applause from the audience. For the first time in history, the FBI has added a domestic terrorist to its list of “Most Wanted” terror suspects. Daniel Andreas San Diego, a 31-year-old computer specialist from Berkeley, is wanted for the 2003 bombings of two corporate offices in California. San Diego is an animal rights activist who graduated to bombing for his cause. The explosions caused minor damages and no injuries. A group calling itself “Revolutionary Cells” took responsibility for the blasts, saying they targeted the companies because they performed drug and chemical experiments on animals. There is a $250,000 reward for information leading to his capture. San Diego is the 24th person on the list, and the only domestic terror suspect. It seems a bit silly that this man who has caused no deaths is on the same terror list as 9/11 mass-murderer Osama bin Laden. More likely, this is a politically-motivated move to balance things by adding a left-wing terrorist to the list just days after the Obama administration was criticized for reports suggesting that military veterans could be susceptible to right-wing extremism. Perhaps the real message is: extremism is bad on all sides. The U.S. Congress is considering a major reform of copyright law intended to solve the problem of “orphan works,” copyrighted material whose owner cannot be found. This “reform” would significantly limit the rights of original artists and unnecessarily burden them with costs and bureaucratic paperwork. 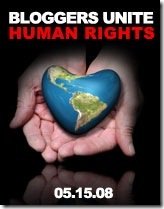 Today is May 15th, “Bloggers Unite For Human Rights” day. Human rights represent one of the most agreed upon ideas—that all people are born with basic rights and freedoms that include life, liberty and justice. This year marks the 60th anniversary of the “Universal Declaration of Human Rights” adopted by the United Nations. After a year of blogging, it’s easy for me to forget what an awesome privilege it is to have an international platform for my thoughts and ideas. As an American, I take for granted that I can say just about anything–as long as it’s true–and not fear for my life. Given that you are reading this article, you likely live in a country with similar freedoms of thought and expression, so you also have reason to be thankful.